Most European leaders and parties have agreed to the Spitzenkandidat principle. 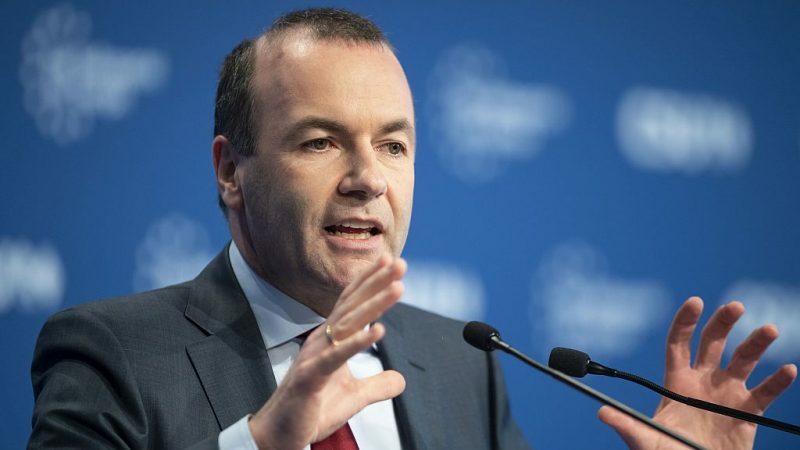 If they suddenly ditched it, it would be a huge step back for democracy in Europe and could risk conflict between the European Parliament and the Council, said Manfred Weber, the centre-right EPP party’s Spitzenkandidat for the European elections. In an interview with EURACTIV’s media partner Tagesspiegel, Weber talks about the European elections, Brexit and Viktor Orbán. Mr Weber, what must happen in the UK so that a “tough Brexit” can be avoided on 12 April? There are two options. Either the British people are going to be involved through new elections or a second referendum. Or the House of Commons accepts the Withdrawal Agreement in the end. Britain has to clarify this domestically. Otherwise, the risk of a hard Brexit is very high. Can the EU Withdrawal Agreement still be changed? No. We are sticking to the Withdrawal Agreement because it anchors crucial European basic principles. This implies that we do not want a hard border with Northern Ireland which could mean new conflicts in Ireland. While Chancellor Merkel apparently wants to avert a hard Brexit until the very last moment, France’s President Macron seems less concerned. Which side are you on? My position is that the 440 million other Europeans have the right to be told by London before the European elections what the state of play is. That is why British politics now have the duty to clarify things. Both a second referendum and new elections, which could be organised quickly, could provide the necessary clarity. Before the EU summit on 10 April, which EU Council president Donald Tusk has now scheduled, it must be clear what will happen. If an extension serves only to gain time without a goal, then both sides only waste their capacities. What would speak against the participation of the British in the European elections, if a “hard Brexit” could be averted by that? The daily dramatic uncertainty in the UK must not spread to the other EU states. I warn against that. If a country wants to leave the EU, then it cannot have a significant impact on the future of Europe. It is already difficult for UK MEPs and representatives in the Council of Ministers to determine EU legislation on future affairs. But if a new European Parliament is elected soon and a new EU Commission comes into office, then it cannot be the case that a large country, which wants to leave the EU, has a major say again. That is why we need clarification before the European elections. But if there is this clarification, should the British take part in the European elections? It makes no sense to speculate. So far, for all the options are available, the no-sayers in the British Parliament have a majority. For months, you have been travelling the whole of Europe as a potential candidate to succeed Commission President Jean-Claude Juncker. What are your key findings? First, there is the beautiful realisation that people take it positively when a European lead candidate comes to listen. What’s striking is that people are asking similar questions across national borders. For example, at a community centre in Cyprus, in my first meeting during the listening tour in January, a farmer complained about the bureaucracy involved in awarding EU funds. The same happened in Ireland. I know that as well from my Lower Bavarian farmers. All in all, there are two mega-topics that shape the continent: migration and the question of how to proceed economically in the face of clouding economic prospects. Five years ago, the European election campaign between EPP’s Juncker and leading socialist candidate Martin Schulz was a tame affair. Will this be different in the duel with Social Democrat Timmermans this time? I am eager for that. I want to show people that there are alternatives. That is why I am campaigning with a clear program. For example, I want to end the EU accession talks with Ankara because Turkey cannot become a member of the EU. The German SPD is very vague in their election program. Another example: I will make it clear in the election campaign that we Europeans will only have an economic future if we continue to conclude trade agreements. That was not clear to the SPD in discussing the CETA agreement with Canada, and even the Greens were against it. In German domestic politics, the planned tightening of the arms export directives is a controversial issue between the CDU/CSU and the SPD. How does the tightening, primarily advocated by the SPD, fit with the European defence policy you demand? Europe needs more cooperation in the armaments sector. This is obvious when it comes to drone technology. If the technology is Europeanised, then we also need a common understanding of the export policy. In doing so, I am in favour of a European approach that reconciles both the needs of industry and our goal of not exporting to war zones. There is no point in regulating this only bilaterally between Germany and France. But in any case, the SPD cannot approach this solely out of domestic political motives. You keep saying that you want to bring the “black box” Brussels closer to the people. Let’s take an example: EU legislation in the so-called trilogue between the Commission, the European Parliament and the member states runs without publicity. Would that change under Commission President Weber? I stand for a much broader approach: We need more democracy, transparency and a different style in the EU. The best guarantee for this is the parliamentarisation of Europe. If the future decisions are taken in the plenary session of the European Parliament, then they must be binding on the Commission. I want to be a Commission President of the Parliament. Parliament is the place where citizens are first and foremost involved. This is how democracy works: if MEPs do not keep their promises, they will be voted out in the next election. One of your goals is to keep the percentage of populists in the European elections as low as possible. How do you want to achieve this? Firstly, people’s concerns, such as migration or digitisation, need to be taken seriously. Specifically, this means that we need to know who is in the EU territory. The state must have control, not tug gangs. And secondly, we have to strongly crack down on radicals. The AfD is a danger for Germany. It marches side by side with Pegida, the NPD and the neo-Nazis. This party may not come to the European Parliament in relevant size. The EPP has suspended the membership of the Hungarian ruling party, Fidesz. Are you sure that this will stop the Hungarian Prime Minister Orbán’s campaign against Brussels before the European elections? The decision to suspend Fidesz membership has clear consequences: Fidesz no longer participates within the European People’s Party and may not propose candidates for EPP positions. Viktor Orbán is no longer sitting at the table when the leaders of the EPP hold their pre-EU summit meetings. It is therefore clear that developments in Hungary are not in line with the values for which the EPP stands. It is now up to the Hungarian friends to rebuild trust. I do not know if it will succeed. The exclusion of Fidesz from the EPP is still an option. Do you support the demand of CDU leader Annegret Kramp-Karrenbauer that Strasbourg should no longer be the seat of the European Parliament? The European Parliament must finally have the right to decide completely on its own work organisation – just as the Bundestag has decided on its move from Bonn to Berlin. However, this would require an amendment of the EU Treaty which establishes Strasbourg as the seat. Danish Competition Commissioner Margrethe Vestager is part of a team of seven politicians that the liberal ALDE family has created for the European elections. Does she have a chance to become President of the Commission? I would have been happy if Margrethe Vestager, whom I appreciate, had joined into the Spitzenkandidaten race. That’s not the case. With a single Spitzenkandidat, the Liberals could have provided clarity. But in this way, they don’t. Vestager also has the support of Macron. Could France’s president, who rejects the whole Spitzenkandidaten procedure, put a halt to your ambitions? We as EPP are going our own way – with great unity. If the EPP should become the strongest party in the European elections, then we have a democratically legitimized claim to leadership on the continent. That’s what we fight for. And I hope that then everyone respects the principles of parliamentary democracy. What exactly would happen if you won the European elections, but in the end, the leaders should conjure up another candidate? It should not be forgotten that most of the European parties and many heads of state and government have supported the Spitzenkandidat principle. If they suddenly forget this, that would be a huge step backwards for the democracy and participation of voters in Europe. There would be a conflict between the European Parliament and the Council of heads of state and government. Nobody wants this strained situation.